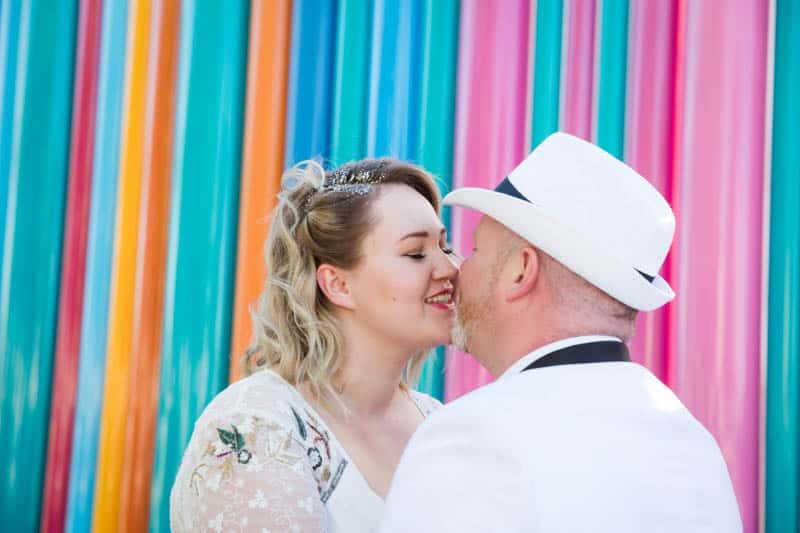 This adorable couple planned their destination wedding in just 10 weeks and traveled all the way to the US to get married in front of the iconic Las Vegas Statue in front of The Smith Center of Performing Arts. I pretty much Google mapped Vegas and the surrounding areas (having never been in the US before) to get the feel of the city. Then did some further research on Instagram and stumbled upon a picture of this colourful, tall wall that seemed interesting, especially as a background for photography. And that’s how we found the Smith Center for the Performing Arts.” She explained. “We had to get everything done within 10 weeks. I wasn’t nervous but thought that, as long as we have the officiant, we’ll be fine. If the luggage gets lost, I’ll marry in jeans…or a bikini! Fortunately, everything worked out just great. When we got to our destination, it was hot outside and I was just like..lets get on with this people! I’m sweating my make up off!” She laughed. I guess if I were to do anything different I would have liked my outfit to be more more sparkling, like Dorothy from Wizard of Oz and perhaps some different shoes? We also should of had a plan of what we are going to do afterwards because we just went to a random restaurant…which was nice but too…casual and a bit boring.” suggested Maren. An astonishing job in such a short space of time. Adore the detailing on the dress! Wow 10 weeks! I would go crazy but this looks lovely! wow, must be super organised couple to plan such a fabulous wedding in just 10 weeks! Very impressive!